Archos is known for its portable media players, but also has a range of netbooks, including the Archos 10. 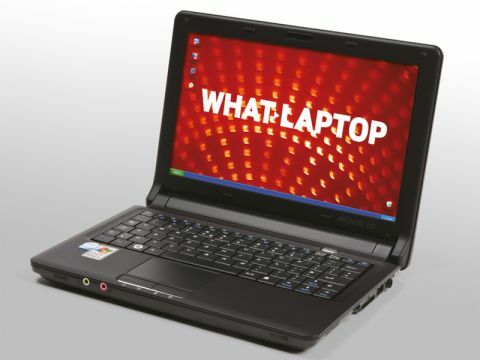 As the name implies, this is a 10-inch netbook, offering an affordable entry into the netbook market. The 10-inch screen features a 1024 x 600-pixel resolution that offers reasonably crisp images, but falls behind the latest panels for sharpness. It is vibrant and bright, but the glossy coating highlights reflections in bright conditions. The keyboard is incredibly poor by recent netbook standards, providing a user experience that has more in common with much earlier 8-inch machines than its contemporary rivals. All of the keys are cramped, but the worst are those around the edges – such as the tiny half-sized shift and punctuation keys – that make it almost impossible to strike up a good typing rhythm, and can lead to discomfort after longer periods of typing. The touchpad offers slightly better usability, but is still let down by its use of recessed buttons that are fiddly to use. The black chassis lacks any design flourishes, although it is certainly tough enough for daily use, and the 1.3kg weight is portable enough for travel use. Power comes from a 1.6GHz Intel Atom processor – although it's the N270 variant found in earlier netbooks, rather than the more power-efficient N280 chip. It offers reasonable performance, but battery life – at 184 minutes – is no better than average. Three USB ports make it easy to connect peripherals, and there's a VGA port for hooking up to monitors or projectors. It's also a useful machine when it comes to internet use, with BitDefender AntiVirus pre-installed as standard, letting you take full advantage of the 802.11g Wi-Fi adapter and browse the internet in safety. Although it's affordable and highly portable, the lack of any stand-out features whatsoever and the truly appalling keyboard make it impossible to recommend the Archos 10 over its rivals. This is one netbook best avoided.